Em And The Big Hoom is a touching story about love and family relationships. It is a story of a mother, father and two children, and their everyday struggle in dealing with their tragedy stricken family. It is a narration by the son who speaks of the unconditional love that his father, The Bog Hoom, had for his mother, Em. Though the story is about the chaos that exists in a family, it is different in the way it speaks of love. Em, The Big Hoom and their two children live in a small apartment in Mahim, Mumbai. The mother, Em, has managed to make her family a slave to her state of mind and is sometimes flamboyant, has a compelling imagination, and at times makes cruel judgments. She seldom speaks of or shows her love for her family. Her husband and family still hold on because of their love for her. They learn to live with her manic behaviour and frequent wish to die. The novel is a study of a mental illness and contains dark humour. It is also a critical and deeply moving story by the author, Jerry Pinto. 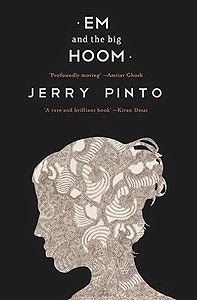 Jerry Pinto is an Indian writer who is based in Mumbai. He writes poetry, prose and children’s fiction in English. He is also a journalist. Some of his works include: Helen: The Life and Times of an H-Bomb, Surviving Women and Asylum and Other Poems. Em and The Big Hoom was his first novel. His book Helen: The Life and Times of an H-Bomb won the Best Book on Cinema Award at the 54th National Film Awards.